The bearded collie emerged from the cross of Polish Lowland Sheepdogs and Scottish herding dogs. The dogs were used as sheep herders in scotland around 1514. 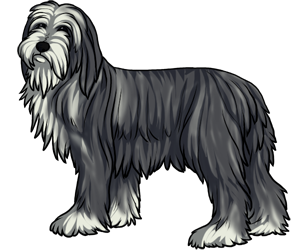 Today, the bearded collie is a wonderful herder as well as companion dog that has become popular within the last half of the 20th century. The breed gets its name from the long fur that grows above its mouth making it look like it has a beard. The bearded collie is also known as "beardie" for short.